I headed out to the Grandview, MO Hamfest (aka the South Side Amateur Radio Club’s Octoberfest) this morning – about an hour’s drive. It was a smallish hamfest hosted at a middle school. The main floor was in the gymnasium’s basketball court with a spill over section in the adjacent cafeteria. What I noticed most of all was everyone eating… biscuits and gravy with eggs was quite popular. The doors opened at 0900 but I arrived around 1030 and it seemed by this time the hamfest was starting to wind down. Most of the tables were filled and the two big vendors there was the local ham store (Associated Radio) and WB0W. The oddest thing I saw was a gentlemen trying to sell golf clubs. One general criticism (and I’ve seen this at a few hamfests) is not publicizing the forums ahead of time. If you are going to host one or more forums – put the forum name, the subject matter, and start times on the hamfest’s webpage. It may create a larger draw for your event. Also had an eyeball QSO with WE0Z who I have bumped into on APRS a few times. One last comment – while I think it is cool that you connect Oktoberfest with a hamfest, the real Oktoberfest happens in September and only a day or two in October… plus if you call your event Oktoberfest you probably need to have some beer present. I am not sure how sales of beer would be at a middle school on a Saturday morning with a bunch of ham geezers in attendance, but it would be interesting to see… and nothing goes better with biscuits and gravy than a nice beer. Both on my drive there and back I listened to K1G on 20M, a special event station near Boston commemorating the 70th anniversary of the Coast Guard Axillary. On the way there he was working all over Europe and on the way back he was working state-side stations. I was one of many who were able to get him in the log. Temperatures have dropped here in eastern Kansas, off the Missouri and Platte Rivers. Morning temps are getting down to the high teens but we’ve had generally clear skies – so no snow yet. Been having a problem with my Toyota Tundra. I had the shocks replaced about two months ago, but I am still having a suspension issues. Often when I drive over uneven pavement I hear a type of popping or low banging. I’m dropping the truck off tomorrow morning at a garage in town and I hope they identify and fix the problem. I popped the first cap on the KC Ale this past Thursday. One word: Tasty! I was so happy with the results that I brought in a 12-pack to distribute to my small group at CGSC. We will see what kind of feed back I get tomorrow. The KC Ale batch has a great cooper color, medium head, slight hoppy aroma. The taste is crisp and smooth, no off-flavors. The California Common batch went into secondary fermentation last Tuesday (18 NOV). I’ll try to get it bottled up this coming Wednesday (26 NOV). Then it should be ready for a first by 11 DEC… a good day to celebrate my last night class for this term. While the CGSC program here at Fort Leavenworth is considered a Masters-level program, it does not award a degree at graduation (unlike the Navy’s program in Monterey or the Air Force in Alabama). Therefore, in order to get a masters, I signed up to take two night classes a week and then by graduation I’ll get the degree. It is a bit of pain now, but this is really the only opportunity I am going to get to earn a master’s degree. Back to beer: I need to get crackin’ and cook up the batch of Raspberry Wheat. If I am able to get it into primary fermentation today, I should be able to hit secondary fermentation by next Sunday (30 NOV) and then bottle by 14 DEC. It should be nice and tasty by New Year’s Eve. I need to put together a sample pack for my Team Jedi brethren (Team Jedi are the fine folks I spent my last year in Iraq with). So it looks like the pack will consist of ESB, KC Ale, California Common, and the Raspberry Wheat. I’ve also had a request from the 7-land Inbound QSL Bureau back in Oregon. I received an email from Marc, NC7M, who let me know I had 200+ QSL cards headed my way. I need to also replenish my postal funds for the bureau. And next week – I will answer all the YI9MI QSL card request that I have… which is quite a significant pile. KC Ale update: I racked the KC Ale to a carboy for secondary fermentation on 31 OCT. Last night I bottled it (finally figured out how to use the “wand” for filling the bottles). Bottling went well and the KC Ale should be ready to try by Thanksgiving. California Common: cooked a batch last night. This recipe is suppose to be similar to Sierra Nevada… I’ve got high hopes. I’d like to get it to secondary fermentation by this weekend. Next in line is a Raspberry Wheat – it is suppose to be similar to a version that is served at a local Leavenworth microbrew: The High Noon Saloon. After that, I’ve got a request for chocolate stout. That should be tasty. Speaking of tasty… the ESB turned out pretty nice. It took the KC Ale a while to start fermenting – I thought there might be something wrong. I had it in the fermenter on Saturday but didn’t start seeing bubbles (i.e. the start of fermentation) in the airlock until Monday. Looks like it is progressing nicely now and I’ll probably rack it to secondary fermentation Friday night. I sampled one of the ESB bottles tonight. The ESB was cooked on 10 OCT, racked to secondary fermentation on 13 OCT and bottled on 18 OCT. It was pretty good, but I’m probably going to let it sit for another week. The KC Pale Ale is in the bucket (aka primary fermentation). I want to strain from the cooking pot to the primary fermentation as well as doing some aeration. I hydrated the yeast, but I think the water I used was to hot – we’ll see. Still have not used the hydrometer – I need to figure out how to take a small sample and use the hydrometer. Maybe between primary and secondary fermentation? It took about 15 minutes to cool the wort down to 70F. I used the kitchen sink and lots of ice. We will see if the airlock is bubbling tomorrow morning. Although I’ve not yet sampled the fruits from my initial Kansas brewing efforts (the ESB batch), I’m going to get another batch going. Each batch is 5 gallons, of which I plan to give away a good portion – assuming it is potable. This batch will be Kansas City Pale Ale. I’ve had a taste lately for Sierra Nevada Pale Ale. So I’m attempting to see if I can replicate the Pale Ale goodness here in the basement. (1) Actually use the hydrometer. (2) Filter and aerate the wort prior to fermentation. (3) Hydrate the yeast prior to pitching. Next week I’ll do my first taste of the ESB and see how it turned out. This batch of Pale Ale should be ready before Thanksgiving. I started reading this book, by Ken Wells, on my Kindle. Great read that covers the history of beer – which I knew started in Iraq but ironically you are not allowed to drink it there now. 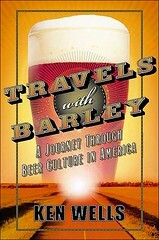 The story follows beer to America, the development of the brewery system, the ascendancy of the big breweries, and the explosion of microbrews. The backdrop for the story is Ken Wells journey along the Mississippi River, from north to south, in his attempt to locate cool beer joints. Wells even mentions the first recognized microbrew in the US – Bert Grant’s place in Yakima, Washington. I’ve been there and was a big fan of Bert’s brew. I think it is closed now and been replaced by the Yakima Craft Brewing Co. Grant’s was a great pub with wonderful brew. Although my favorite Washington microbrew is the Ram Big Horn Brewing Company. I’m really enjoying Ken’s roadtrip but it’s making me thirsty. We had an offsite for class this morning at the Santa Fe Station in downtown Leavenworth, KS. Great breakfast and great discussion. I’ve got the wort in the bucket, should be done with primary fermentation in a day or two. This was the first time I had a hydrometer and I need to figure out how to use it. I’ve got to get a good bottle count. I have about a dozen with the rubber seal and stopper. I think I may need to get new rubber seals. I have to decide if I want to do a secondary fermentation with the carboy. I turned on the HF rig briefly and heard stateside stations talking with a station on Guantanamo. Then I heard a familiar voice, K4STW, Stew in Virginia Beach. Stew probably doesn’t remember me, but we chatted now and again on the 2M repeaters in Hampton Roads. It was great to hear his voice. I got Ubuntu working with my Linksys print server. This will make my life much easier. Looks like we’ll have good weather this weekend. I hooked up my Morse key to my Icom IC-7000 and it appears to be working fine. Also hooked up an external speaker which is working nicely. I tried to connect my SM-20 microphone but realize now that a need a connector that I don’t have. I don’t want to hook up my Heil headset with the boom mike just yet. I was able to have a QSO with an Italian station and again with TI8II (Costa Rica), except on 20M this time. I’m prepping to start a batch of homebrew beer. Tomorrow I’m going to start the process. Maybe have some fresh beer by Halloween? My travels home was long and slow, but forward progress was consistent. After spending more time than I wanted to in Kuwait, we arrived in the US to McGuire Air Force Base, NJ and were transported over to Fort Dix were we’d remain overnight. Our bus was met by a small group of Vietnam veterans, some in wheelchairs or missing limbs, all greeting us with smiles, hearty handshakes and a “Welcome Home”. The vets goal is that never again should a US soldier arrive home from war without a welcome. I was truly moved by the selflessness of these vets and although I would be completely content if the US never again has to send soldiers into harms way, I would like to return the kindness and fellowship I received that sunny afternoon. The next morning we loaded up on buses and headed to Philadelphia to take a commercial flight to Kansas City. There was a bus ready to pick us up when we arrived to Kansas City, which set the tone for the next two days in which we outprocessed at Fort Riley, KS. We completed a lot of activities in our few hours at Fort Riley: medical screening, records updating, pay adjustments, equipment turn-in, “re-integration” briefings, after action review, as well as an opportunity for me to take my team members to The Little Apple Brewing Company (Manhattan, KS) for my long-delayed promotion party. I was promoted to the rank of Major back in October 2007 and it is Army tradition for the newly promoted to throw a party (i.e. an event with beer). As I was unable to do this properly while in Iraq (US soldiers are not allowed to possess or consume alcoholic beverages in Iraq), I was glad to have the opportunity to carry out the tradition back in the states. And then the next morning, June 6th, it was over. Our team members said their goodbyes. Some had their vehicles at Fort Riley and were driving to their next destination. Most of us headed back to Kansas City to fly home. It was good to be home. Wife, daughter, dog, and cat – all together again. Next on the agenda: move house and household, bag and baggage from Hampton, Virginia (where I had been stationed at Fort Monroe prior to my deployment to Iraq) to Fort Leavenworth, Kansas to attend the Army’s Command & Staff College.